This weekend is the second-annual wine release party at Mosquito Fleet Winery in Belfair (21 Od Belfair Highway) and we highly recommend you make the visit. From 11 a.m. to 5 p.m. the winery will be open for people to taste the six newly released 2010 wines, paired with chocolates, cheeses and listen to live music. The cost is $10 but it’s waived with a wine purchase. Brian Petersen of Mosquito Fleet Winery invited us to barrel taste these wine twice now, and we’re grateful for this learning opportunity. Barrel tastings are more about the grape than the final blend in the bottle. It’s wine in a basic elemental state, still showing all of its angular youthfulness. What the final blend will taste like at this point is left to imagination and many months of tasting and blending until the winemaker has achieved the final product. Barrels are one of the tools that winemakers use to spice up the wine. Barrels, in addition to a few other techniques, are sort of the salt and pepper of the winemaking world. The staves of the barrel are generally toasted to some degree. Light, medium, medium plus and heavy are the different levels of toast that a winemaker will ask for when ordering barrels. The barrel heads are also sometimes toasted. With “toasted heads” more flavors are imparted in to the wine. With barrel toasting, strong tannins aren’t as easily extracted while the wine ages in the barrel. Considering some tannic, heavy reds may spend two to three years in a barrel, judicious use of oak is needed. Our first invite to attend a barrel tasting at Mosquito Fleet was last spring. Brynn was unable to attend because she’d just had the baby, so I went down solo. It was one of nicest, educational barrel tastings I’ve attended. Six months later we were invited back — this time Brynn came along, and so did the baby — and it gave me the chance to taste what six months of aging did for the wine before the final blend and bottling. 2010 Pepperbridge Cabernet: We began with this in the barrel which was 100 percent cabernet sourced from Walla Walla’s Pepperbridge Vineyard. Winemaker Brian Petersen planned to eventually blend it with a little cabernet franc before bottling. This medium-bodied wine had a bracing amount of acidity with raspberry fruit. It was aging in a barrel with medium plus toast on its staves and barrel heads. 2010 Syrah: In barrel more body, less chunk; bright raspberry fruit and nice spicy finish. Very bright. 2010 Syrah: This was blended with 19 percent mourvedre and 7 percent cabernet. In puncheon saturated color. Stinky nose, nice up-front fruit; thick with an astringent finish. 2010 Petite Verdot: In barrel with minor amounts of mourvèdre and syrah. Bready nose up front from aging sur-lie. Brilliant purple robe, long legs, spicy raspberry with a hint of herbs and spice. The nose needs to develop. 2010 Cab Franc:From Pepperbridge Vineyard. In barrel there was of raspberry and black berry fruit. Soft. Not the final blend. 2010 Meritage: In the barrel there was 100 percent cabernet from Pepperbridge Vineyard. Pepperbridge fruit adds some bracing tannins that will soften with age. Brix at harvest was 24.2 with a PH of 3.8 and alcohol 13.9 percent. Elevage for 22 months on new French oak with a small amount of American oak. Beautiful nose of red and black fruits, nice balance, medium-bodied with a red fruit finish and a bit of mocha. Touriga Nacional Port 2010: Made with two of the six port grapes — 82 percent Touriga Nacional and 18 percent Tinta Roriz from Two Mountains Vineyard on Elephant Mountain. Brix at harvest was 23.5 with a PH of 3.81 and alcohol of 21 percent RRS 8.6 percent. Elevage 24 months on French oak; bottled November 2012. There are 72 demi cases 6/500ml. Black-red color, sweet nose with caramel and alcohol, black cherry. This is a thick rich, well-balanced, fabulous wine. Well, this isn’t exactly how I imagined the first entry for this blog, but after more than six months of talking about starting a wine blog, it finally got to the point where we needed to get something up and running. And what better way to introduce this blog to the community than through an invitation to drink wine? August appears to be a good month for wine — although I’m sure as I get plugged into the wine world (beyond my regular trips to the Fred Meyer wine section) I’ll see more and more wine events popping up during the other months. The three events I’m listing below range from Gig Harbor to Agate Pass. Two of them are being held to benefit Kitsap organizations. The first event is in Gig Harbor and is this Saturday (Aug. 7), so it’s short notice for those who like to plan ahead. It’s the Gig Harbor Wine and Food Festival. It looks like this is the inaugural event, which is presented by the Harbor History Museum and the Gig Harbor Historic Waterfront Association. You need tickets to attend, and early bird prices are gone, so tickets are now $75. They can be purchased from the event website: www.harborwineandfoodfest.com , or by calling (253) 858-6722. For those who love Top Chef, season five chef Fabio Viviani will be on hand to cook off against Gig Harbor chef Craig Haslebacher. There will be a tasting tent with more than 35 wineries pouring their creations, and select restaurants and food purveyors will offer food selections to pair with the wine. For the foodies: cooking demonstrations, and for the winos: wine seminars. There will also be opportunities to bid on dining packages, insider experiences and many other luxury items. To see the complete list of happenings for the Saturday event — held on the grounds of the Harbor History Museum, 4121 Harborview Drive — visit the website. (www.harborwineandfoodfest.com). The next weekend, if you’re feeling like staying closer to home, there is the second annual Kitsap Wine Festival at the Harborside Fountain Park. (That’s the park with the brass-colored fountains that resemble submarine sails right next to the Bremerton ferry dock). The event is Saturday, Aug. 14 from 2 to 5:30 p.m. Order your tickets in advance. Price is $50. That includes a commemorative wine glass, and unlimited tasting of the wines and various food options. (Last year you paid to enter, and paid for food. That won’t be the case this year). The event will be similar to last year, but will span the whole park, will feature 36 wineries from Washington and Oregon, and will include food from the Kitsap Conference Center, Anthony’s at Sinclair Inlet, Old Town Bistro, Clubhouse at McCormick Woods and Bella Bella Cupcakes. New to the event this year will be an on-site wine shop, so if you taste a wine you can’t live without you can get it right there, and a second band has been added to the lineup, according to Terry Halvorson, general manager for the conference center. Halvorson said last year’s event was so successful they’ve added more tickets this year. A total of 700 tickets were up for grabs, but 400 have already sold. So jump on it! Buy tickets online at www.kitsapwinefestival.com or in person at the Kitsap Conference Center, 100 Washington Avenue, Bremerton. 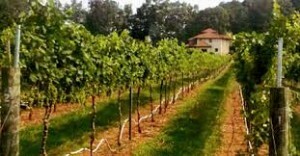 Check out the website for information about what wineries will be there. Net precedes from the event benefit the Harrison Medical Center Foundation. Last year the event raised $5,000 for the foundation, this year they hope to double that amount. Lastly, the final event I know of in Kitsap for wine this month is a fundraiser for the Holly Ridge Center. Executive director Roxanne Bryson says they’re hoping to make this their signature event, and I hope it sticks because it sounds like so much fun. The first annual Vino Kitsap Scavenger Hunt is scheduled for Saturday, Aug. 21 with staggered start times between 2 and 3 p.m. Tickets are required, and only 125 are available. They run $50 a piece. “Hunters” will receive a signature bottle of wine from Silverlake Winery at the end of the event for participating. At the start they’ll be handed a passport to fill along the way, and will receive clues to direct them to the next stop, which will take participants to an in-home wine shop, a winery and finally a private estate overlooking Agate Passage in North Kitsap. A total of seven wines will be featured at the event. The event starts at the Siloam Retreat and WineShop At Home, 2755 Lake Tahuyeh Road, Bremerton. At the end of the scavenger hunt the overall winner will receive a case of wine. Bryson guesses more than one person might have their passports filled and handed in at the same time, which means they’ll throw the names in a hat to draw a winner. The case of wine will include an assortment of different varieties. For tickets, or more information call Bryson at (360) 373-2536, or register online at www.hollyridge.org . The website also has more information about the event. Net proceeds will go to benefit the Holly Ridge infant and toddler program and the adult services program.